Just trying to see if anyone even uses this forum. 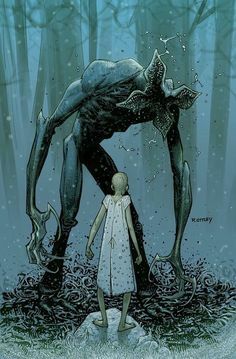 Was it just me or did the Monster in Stranger Things look like a "star headed" Elder Thing? The whole story line of (spoiler) a predator plant like monster spreading through spores from another dimension that can come through walls when the time is right is downright Lovecraftian. I totally agree. It really hit all the right spots! NICE! love your show, been listening for 8 years I think. I find myself in the minority but I wasn't that enamoured with Stranger Things. It was okay but it wore its (many, many) influences too obviously. Pretty much every scene you could point out what film, show, book they were paying an homage to...well, maybe not every scene but it was almost non-stop. It didn't really bring anything new to the table.